L.A. Theatre Works presents “Sisters Matsumoto” by Philip Kan Gotanda on Friday, Nov. 16, at 8 p.m.; Saturday, Nov. 17, at 3 and 8 p.m.; and Sunday, Nov. 18, at 4 p.m. at the James Bridges Theater, 235 Charles E. Young Dr., Melnitz Hall on the UCLA campus. 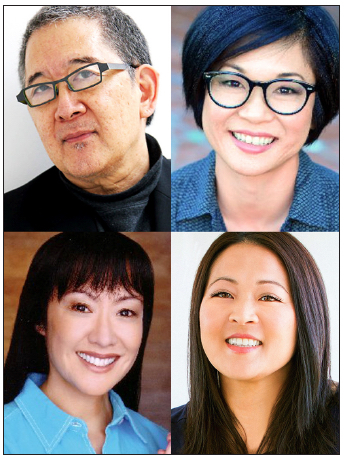 Clockwise from top left: Playwright Philip Kan Gotanda, cast members Keiko Agena, Suzy Nakamura, June Angela. Located on the northern edge of UCLA campus in Melnitz Hall, just off Sunset (at Hilgard). Parking in Lot 3, steps from the theater. Listening devices and ADA seating available. Call box office for accessibility info. Gotanda is a Bay Area-based playwright who has been artist-in-residence at Stanford University, UC Berkeley and Berkeley Repertory Theatre. His plays, many of which explore Asian American issues and experiences, include “The Life and Times of Chang and Eng,” “After the War Blues,” “Under the Rainbow,” “The Ballad of Yachiyo” and “The Wind Cries Mary.” He also wrote and directed the films “The Kiss,” “Drinking Tea” and “Life Tastes Good.” On the web: www.philipkangotanda.com/. In L.A. Theatre Works productions, Hollywood and Broadway’s finest perform without sets or costumes for later broadcast on public radio nationwide. Casts subject to change. Box office: (310) 827-0889, open Monday through Friday, 12 to 6 p.m. After hours: (866) 811-4111. All sales final. For more information, visit https://latw.org/live-in-la.